Tips and techniques, questions and answers, works and commissions. ← Hinged Ring – for the troubled finger. Pretty simple to make, fiddly and time consuming to carve. The clients grand mother had a pair of diamonds, 1ct each, in a ring. It was broken down and each of her grand daughters was given one of the diamonds. The shoulder diamonds were an after thought. Unless circumstances make it unavoidable, I don’t like putting diamonds of the same shape but different eras together. 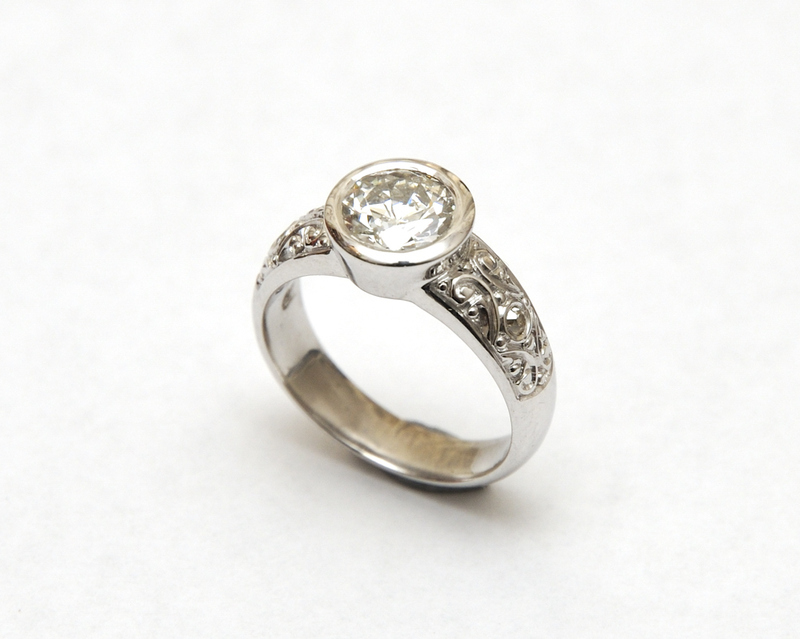 In this case, the centre diamond is an old-brilliant cut from the 1920’s. To put it with a modern brilliant cut from post 1960 makes note of the combination. I sourced the old single cuts to go with the main diamond so as not to detract from it. White gold and diamond, engraved engagement ring. Details: 18ct white gold engagement ring. Main setting is bezel set 1ct old-cut with 3pt single-cut diamonds pressure set in the shoulders. Hand-made ring with engraved shoulders. Hinged Ring – for the troubled finger.